A long awaited report by British Geological Survey on the mainland shale gas geology has been released. The region covered is usually referred to as the Bowland shale and is under most of the former industrial north of England. The report does not cover all of the UK but nevertheless the estimated volume of shale gas is huge, you in your lifetime will never see the end of it, nor probably the end of bleating either. Extraction efficiency is as ever indeterminate but unimportant at this stage. Not that humans ever get better at doing things. Andrews, I.J. 2013. The Carboniferous Bowland Shale gas study: geology and resource estimation. British Geological Survey for Department of Energy and Climate Change, London, UK. It would appear that this site is the most difficult to access, of all of the biggest areas. 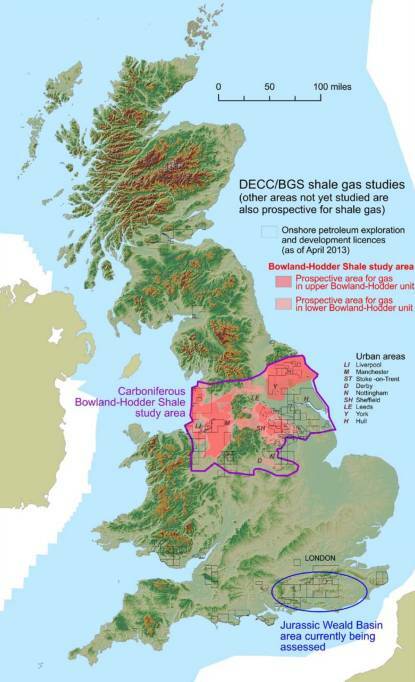 The map of UK shale deposits shows It essentially covering much of England. Then there is the offshore deposits. Makes N sea gas look small-fry. Local reaction to scare stories may be the biggest initial hurdle. Then the rediculous 0.5rs tremour limit. No doubt friends of the Earth will be buying a lorry load of sensors. The good news is that it seems hydrocarbons are available just about everywhere with modern drilling techniques. They are test drilling for oil/gas not 15 miles from me, near Balcombe, Sussex and I have some friends who live on the Somerset Levels who tell me an exploration company will be announcing a large find of gas and oil in the next few months. As drilling methods for greater depths and directions improve, more and more hydrocarbons will be available for exploitation – looks like we aren’t going to hit ‘peak hydrocarbon’ any time soon. Who wants to be Secretary of State for Shale? Meanwhile the Beeb’s very own Harbinger of Doom gleefully points out the downsides of our bonanza. U mean UK may not freeze in the dark in spite of all efforts to do so? No, I think the UK will freeze in the dark. Several power stations are being closed, or are about to be closed, bringing UK spare generating capacity to within a mere 2% of theoretical expected demand just in time for this winter. If the UK manages to avoid freezing in the dark this winter it will be a miracle. No doubt the fat cat directors of the power supply industry will get large bonuses for making the supply to demand ratio so efficient. Don’t think that likely. We’re fully adapted to survive the misery of a cold, wet climate. We’re also lucky enough to have plenty of parks, woodlands and forests – and chainsaws are cheap. Brits are well known for their abilities to survive – not sure some of our more recent residents will get on though? I’m in Barcelona right now, so I have to wait for a printer and time to analyze this further. Still, note some numbers: the control for deeper, which has 5X the shallower part of the Bowland may be only 6 or so wells.. Hard to tell right now. The one reference Cuadrilla well was shut-in conveniently when fracing of some sort was said to cause minor earthquakes: you may find this a reasonable excuse, but my experience of the oil/gas business says that the more likely reason was not environmental but for stock purposes. I.e. perms were so poor as to make the test a “failure”, so the test was ended. The area with potential based on simple minimum depths (1500m) for pressure purposes is reasonable. Maximum depths depend on whether the Basin is extensional or compressive. What I read says compressional – the American basins that are good are extensional, especially if you are thinking of coal gas. Extensional opens frac systems, compressional closes them. You have to understand that hydraulic fracturing does not create economic, productive permeabilities for gas (or oil) to come to the wellbore, but connects them sufficiently to get enough gas (or oil) to come to the wellbore. The natural fractures OR natural very thin beds of permeability – the noted laminae of silt or carbonate – are necessary to exist. If you frac tombstone you get the gas that bleeds into your fractures only; if there are natural fractures and permeable laminae, you get all the gas that spurts into your well-bore connected pathways to your wellbore. Keep in mind drilling densities when someone talks of recoverable reserves, i.e. producible reserves. If they say that there will be 8 wells/square mile, that is because the hydrocarbons cannot travel more than 1/16th of a mile to a wellbore, i.e. 400m, despite the hydraulic fracing. That tells you the recovery factor is low. Even if the Recovery Factor is low, say 3-5%, you would still have a lot of gas to come out, it would appear. Cuadrilla does talk of $US10 million/well, however, and that does not include infrastructure, facilities, distribution systems, taxes, operating costs etc. Plus profits. Be aware of these numbers. When I have more time I will review this document more carefully. The most important I saw in the initial readthrough is at the very end, where they note that all the preceding is about gas-in-place, which I like to call for clarity’s sake, molecules-in-the-ground. Molecules-in-the-ground are like the amount of the grand prize in a lottery: everyone thinks he or she will get it, but only one person will, while the rest simply get to hand over their dollar. This government document is unnecessarily brief and non-committal. The subject is not that difficult these days. If Cuadrilla really had a tiger by the tail, the document would show it in spades. So far there is nothing, it appears, to justify putting one’s neck, political or otherwise, on the line on this subject. Too bad. It’s not so obvious on their website but Cuadrilla damaged their own drilling gear in the earth tremor incident. Their take on it is that it was a rare combination of circumstances. Will the people of the United Kingdom think it proper to have a Prince of Shale? Thanks Doug, that’s an interesting read. Do companies like Cuadrilla have rigorous reporting requirements vis-a-vis the recoverable amounts etc? I get the impression that in the US, at least, people are afraid of having their asses sued by investors if they are caught exaggerating too much. 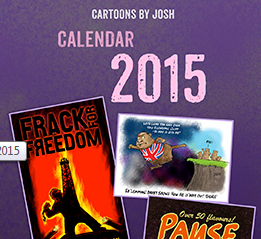 It tells a lot about politics in UK that there exists a department named “Department of Energy & Climate Change. I guess you will all have to freeze for a while in order to get mad enough to throw the bums out and replace them with people who will implement a sane energy policy. Fortunately, most of us living in the USA have watched the antics of California and much of Europe. Y’all have suffered so we won’t have to. Sorry for such a long time replying. Regarding recoverable reserves, which is your point: yes, the securities exchange have huge controls/influence/fear-generating power overe companies and what they say about what they have found or say they have found. You need about a 24-month memory to know about the diffference between what was supposed to be and what actually was. My personal experience is that if 6-months after a claim you don’t have “it” by an engineering compainy, “it” never existed except in the imagination – a hopeful one at that – of company executives. Which is why “resource” or “gas-in-place” became such a (bogus) acceptable term. Even “resource” has, in the States, been restricted, but that gas-in-place (GIP) is still being promoted. It disappoints me hugely that the Brit public is being misled (IMHO) by their governements and even Bishop Hill/GWPF in this regard: my personal term is “molecules in the ground”. No acronym, as we should always understand what we are saying in this regard. I’m now back home and will report specifically on the Brit government report, but as a professional oil and gas geologist, I can already tell you that it is less than short on actuality and more than full on unsubstatiantiated upside: the number of well penetrations and actual test cases is below what I/we would accept for anything but a concept “play” (an idea that may or may not result in an economically sound oil or gas pool). The eco-green idolization of science has been useful for their centralized, liberal use of “scientists” as dispassionate arbiters of knowledge, but it has been terrible for the public (and politicos) who think that certainty and settledness means actual (what I call “representational”, in that it matches truth as the universe creates), certainty and settledness. The public and politicos also think that a “scientist” who states so-and-so “might”, “may” or “could” mean “is”, except that the scientist speaking is too humble to speak more directly. Not at all the truth: all these “scientists” speak to their specialty with regard to the conclusions they have CHOSEN out of a group of possibilities that ARE NOT mathematically validated (statistically), but fit with what the scientist FEELS is either likely or, if pursued, will more likely lead to a good conclusion. It is the same when I map a “prospect”: out of a number of options, I come up with one that leads to a new oil and gas pool, or an extension of another one still untapped. There are others that I could choose, but they lead to nothing. I choose the one that fits reasonably well AND creates an opportunity. The difference between what I do and what Mann (for instance) does (or the IPCC) is that I create a falsifiably scenario. Either geophysical work or direct drilling is fone subsequent to my suggestion. If the subsequent work comes up positively, we go forward; if not, we stop. The Brit shale gas situation has a very worrisome lack of substantive results of early Cuadrilla drilling. The key well was stopped at the time of critical investigation. I have been sucketed by others doing the same, and have seen others suckered: in one case, a wrench happened to drop down the wellbore just as the key test of the zone was about to be done! All of us give the benefit of the doubt to the option that best serves our interests, especially the short-term ones. This is human nature in action. As educated, thinking, skeptical men of science and technology, however, we must keep that human weakness in mind at all times. That is what I am not seeing. The security exchanges in all countries are on the lookout for these dodgy practices that confuse investors. Fact is, if we all knew the actual risks of investments, we wouldn’t do as much as we do – or get into the financial trouble we do (personal or soverign)! But the exchanges only really act when the waste material hits the fan, as it did with god (BreX), Enron, Bernie Madoff etc. etc. The storyline keeps changing. This is something for the >25-year-old investor to pay attention to. Risks don’t really change, but the storyline about why “this time” things are different, is endlessly mutable. I’ve been through at lest 6 downncycles since 1979, and I’ll tell you that each could not be predicted from the previous. The principle is always the same – bogus upside based on hopeful intentions and a feeling that the downside was other people losing money – but the details and the colour are always different. The exchanges try and try, though they close the barn door after the horse is out, but that door is always being opened when it shouldn’t. I saw a report of a study that concluded that “bubbles” were inherent in the operation of any market. Tiny ones thru giant ones. The risk is getting caught in one of the latter!